It is no use. I can't climb the wall...and my tail hurts. I think I broke it, for it's now crooked. I can't get through the invisible wall, so I will have to dig my way through one of the white ones. I started last night. This wall is made of some dreadful dry stuff, which is extremely unpleasant to chew, so I mostly use my paws. 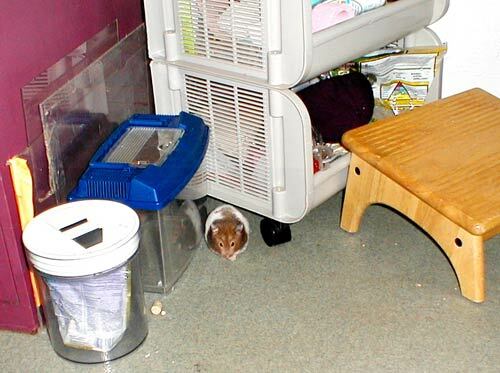 I did not make much headway but I am a Very Persistent Hamster. Awful night. Sweetie did that horrid thing that she calls cleaning the run. I don't mind the sweeping up, but she often throws out my tissue nest along with my snacks. Although she replaces it with more shredded tissue, she doesn't seem to understand that it must be chewed. Also, cleaning removes most of the scent I have left to mark my territory and I exhaust myself having to run around re-scenting everything. And, just for the record, I don't think much of the way They smell either. Well, two new things have happened, one irritating and one exciting. The bad news is that all my walls inside my territory have been covered with a slippery material that I can't chew through. The Pets made quite a fuss when they found my holes, which suggests to me that I was on the verge of breaking through into somewhere interesting. The good news is that Sweetie lifts me over the invisible wall now and lets me explore a New Place. She asks "Want to go up, up, up?" and I climb into her hand and she lifts me over my wall. The New Place is much larger but I figured out right away that that the Pets' world doesn't end there because they can still disappear when I am out there. As soon as I realized this, I found a wall out there to try to gnaw a hole through . It isn't that the New Place lacks challenges. It is only that I must know what lies beyond it. The Pets were peevish the other day when they saw I had made remarkable progress chewing through the wall in the New Place. 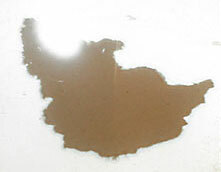 Now it, too, is covered by that slippery material. Do they have an unending supply of the stuff?! 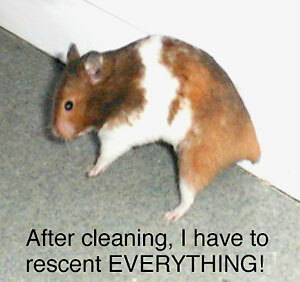 If that wasn't enough to make me cranky, it was a cleaning day again, which I hate! I wish Sweetie would stop throwing out the dried-out vegetables I have been saving. She says she is worried about my eating unwholesome food. I don't want to eat it; I only want to have it. Some days she seems to understand nothing about being a Hamster.